Sorry, been traveling here and there lately so don't really have time to post blog updates. Found this interesting article on EurekAlert! A new study suggests that humans share a common ancestor with orangutans, not chimpanzees according to shared physical characteristics. Comparing physical characteristics instead of DNA, researchers Jeffrey H. Schwartz and John Grehan found that humans shared 28 unique physical characteristics with orangutans, share only two features with chimpanzees and seven with gorillas. Humans share seven characteristics with all three apes (chimpanzees, gorillas, and orangutans). Gorillas and chimpanzees shared 11 unique characteristics. Schwartz and Grehan proposed to have a new "grouping" or classification for humans, orangutans and last common ancestor call "dental hominoids" because they all share similar thick-enameled dental. Read more about this study at EurekAlert! Humans related to orangutans, not chimps, says new Pitt, Buffalo Museum of Science study. A rare footage of the elusive red-capped mangabeys by BBC News. We're not the only species that are capable of laughing according to new study. Great apes are able to laugh like humans too, and they do it frequenty. This finding suggests that the last common ancestor of humans and apes also laughed around 10 to 16 million years ago. 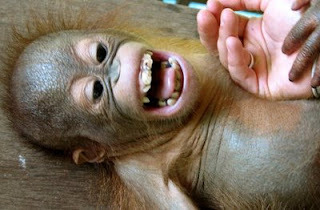 The ability to laugh subsequently evolved among apes and human, resulting in distinctive ways of laughing among them. "Orangutans produce a short laugh series of noisy calls. Gorillas, chimps and bonobos produce longer laugh series and the calls are produced more rapidly" said project leader Marina Davila Ross, a primatologist from University of Portsmouth. With partners Michael Owren and Elke Zimmermann, Davila Ross recorded over 800 recordings of 22 juvenile and infant apes, and also three human babies laughing as they were tickled in their palms, feet, necks and armpits. Presented in the latest edition of Current Biology, the study shows that human laughter is most similar to that of chimpanzees and bonobos, followed by gorillas and orangutans. Human laughter is least similar to those of siamangs, a lesser ape. "These results coincide with the genetic topology of great apes and humans," said Davila Ross. She doesn't rule out if apes or monkeys have a sense of humor but said that "it is difficult to find a method to accurately test it".